The Long Version: After trying different fans over the course of many years in the music business, I started noticing several of my drummer friends using this same model of Honeywell "Air Circulator" with "Turbo Force Power". It's small and therefore doesn't take up much space onstage or in your vehicle. The airflow can be adjusted from horizontal to vertical, which is also perfect for stage use. 3 speeds, the highest of which is rather astonishing and must not be pointed towards an open microphone lest you hear some serious wind rumble from your subwoofers and have to buy a windscreen, which won't help much. Going back to the top photo, you'll notice that it's now 25% Quieter. To make this comparison valid it should be noted that the day I brought home the new fan, I disassembled the old one and gave it a good cleaning, including the motor which also got some new lube. Essentially they are the same age now, or as close as it's possible to make them. Looking at the db readings, you can see that the new design is quieter at all settings. Since decibels are a logarithmic scale, and an increase of 10db equals double the perceived volume, "25% Quieter" is a pretty accurate claim. But is it odd that the new fan's medium speed is the same volume as the older version's slow? Not really, because the new fan's medium speed puts out the same amount of air as the old one's slow. Likewise, the new fan's high speed = medium on the older unit. The new version runs slower, and therefore quieter. For household use, this is fine. If you're in a band, work in your garage a lot, or don't have air conditioning, this reduction in power gets a big thumbs down. Getting back to having cleaned and lubed my older fan for the decibel test--another feature mentioned on the box is "Removable grille for easy cleaning". To me, this was always an important feature since I use these fans in our home 24/7, and quite often in smokey bars or on dusty outdoor stages. 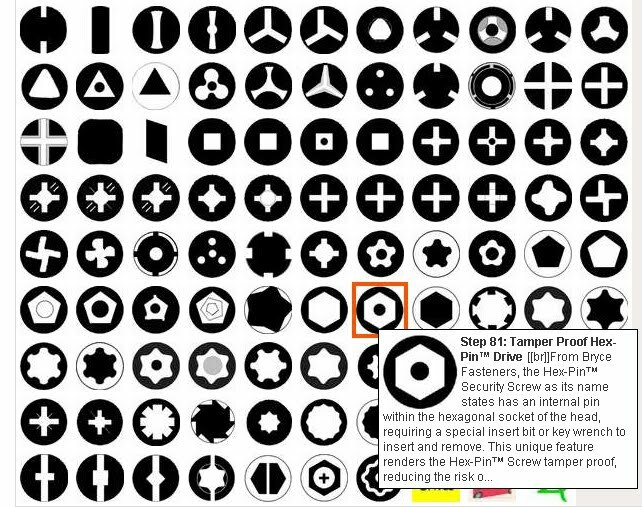 When the blades get heavy with nasty stuff that adds weight, they spin slower. Also, when the grille gets clogged with dust-bunnies and hair the flow is blocked. Thrice a year I blow out the accumulated dust and gunk with my air compressor (or leaf blower) and every summer I take them apart for a complete cleaning and motor tuneup. But when I tried to take apart the white(ish) one a few years ago, I discovered a design change had been made. Two of the six screws that secure the grille had been changed from Phillips head to Allen Security head, so you needed a special (hard to find) hex wrench with a hole in the center to accomodate the security pin! My fan was in desperate need of servicing, and I was locked-out! So I used a Dremel tool's cutting wheel plus an ExActo knife to completely remove the offending screws and all the surrounding plastic, too! It's funny that they now consider this a noteworthy feature when a few years ago their legal counsel decided that it was a liability. Looks like I wasn't the only one who was offended and angered. It's a stupid fan, not a Wii. Only 17.3% of the population is dumb enough to get hurt while opening up a fan to clean it, or so I've heard. 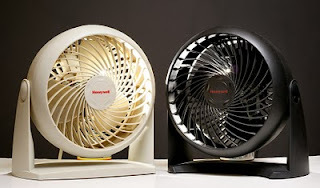 The fan's base has been scalloped front and back, which might make it easier for air to reach a place where it can be circulated, but I'm going to go out on a limb and say that this is to save a few cents per unit on plastic and shipping weight. There are now two keyholes (vs 1) on the base for mounting the unit on a wall. Bottom line is that the new black fan is for the house, and the older white one is for work. I'm going to try and keep it running for as long as possible, to enjoy it's higher velocity airflow. My suspicion is that the motors are the same and that the only difference is in the high/medium/low switching circuitry, which means that I can hopefully keep the older one blowing harder for years to come. The fan blades spin clockwise--the CCW spiral grille seems to counter their turbulence which results in very smooth output that can reach long distances. 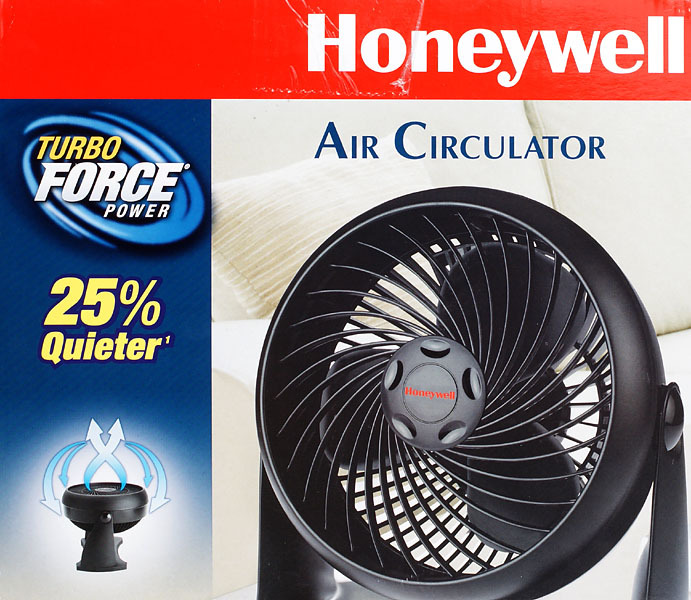 This small Honeywell Air Circulator's retail price varies from $20 in the springtime to $12 in mid-summer, to as low as $5 at clearance in the early fall. Larger versions are available, and they offer some incredible airflow. 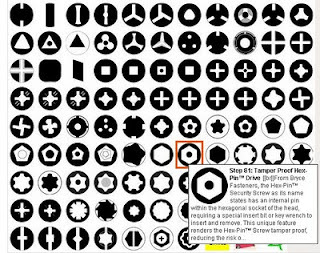 Some people use a small flat blade screw driver and simply break the pins out of the hex socket. Other people take a cheap pen, heat the back of the pen then quickly push that on the screw and leave it for a minute or so before unscrewing the screw.